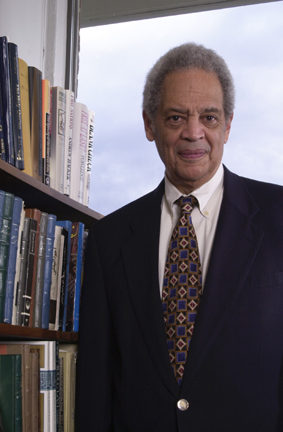 Roger Wilkins as of March 2009, was serving on the board of Institute for America's Future. Wilkins who is a former New York Times reporter, has been assistant attorney general of the United States and a resident scholar at the Institute for Policy Studies. Born March 25, 1932, in Kansas City, Missouri, Wilkins was the only son of journalist Earl W. Wilkins ,business manager of an early black newspaper, The Kansas City Call and YMCA (Young Men's Christian Association) national board member Helen Natalie Jackson. His uncle, Roy Wilkins, was the former director of the NAACP (National Association for the Advancement of Colored People). Wilkins was raised in a middle-class home in the Kansas City area until the age of eight, when his father died of tuberculosis. He then moved to New York City with his mother to live with his grandmother and other relatives in the comfortable Sugar Hill section of Harlem. Wilkins is the nephew of long time Communist Party USA member, Marvel Cooke. After high school Wilkins attended the University of Michigan, and then the University of Michigan Law School. His career began as a welfare worker in Cleveland, Ohio, in 1957. In 1958, after being admitted to the Bar of the State of New York, he began practicing international law at the firm of Delson & Gordon in New York City. Wilkins remained there for four years before moving on to a special assistant administrator post at the Agency for International Development (AID) in Washington, D.C. In 1964 Wilkins spent two years at the U.S. Department of Commerce as director of community relations. Finding government service to his liking, he then accepted a position with the U.S. Department of Justice in Washington D.C. as an assistant attorney general. He moved to New York City in 1969, leaving government work to spend three years at the Ford Foundation as program director and advisor to the foundation president. As director of domestic programs at the Ford Foundation he oversaw the provision of funds for drug-abuse rehabilitation, job training, education for the poor, and a host of minority-related projects. Starting with his service in the Kennedy and Johnson administration, he fought to win passage of the Civil Rights Act of 1964 and the Voting Rights Act of 1965, and subsequently dealt with the horrific problems of inner cities. While with the foundation Wilkins befriended many of Manhattan's "cultural icons", often veteran communist front activists, including conductor-composer Leonard Bernstein and writers Lillian Hellman, Norman Mailer, Arthur Miller and Gore Vidal. In his autobiography Wilkins wrote that this group of prominent friends "seemed as devoid of racism as any group of whites I had ever encountered." In 1970, Wilkins joined the board of the NAACP Legislative Defense Fund. Wilkins left his post at the Ford Foundation in 1972 to work on the editorial board of the Washington Post. His editorials helped earn the a shared Pulitzer Prize with Bob Woodward and Carl Bernstein and cartoonist Herb Block special Pulitzer Prize for coverage of the Watergate scandal. Wilkins worked at the Washington Post for two years and then was a member of the editorial board--as well as an urban affairs columnist--for the New York Times. He later served on the editorial board of The Nation. Never too far from his father's mandate for him to achieve great things, Wilkins's professional productivity also stretched to the Washington Star, where he was an associate editor during 1980, and to the Pulitzer Prize Board, on which he sat from 1980 to 1989. In 1982 Wilkins accepted a position as senior fellow at Washington D.C.'s Institute for Policy Studies, a private research organization. On April 10, 1982, an IPS-sponsored group visiting Moscow for a week of meetings with high-level Soviet officials responsible for disseminating disinformation and propaganda for U.S. consumption, met with U.S. reporters to serve as the unofficial means for floating the possibility that Brezhnev might agree to a New York summit meeting in New York at SSD-II. The IPS group, led by its principal spokesman, Marcus Raskin, IPS cofounder and senior fellow, included Robert Borosage, IPS director, National Lawyers Guild activist and former director of the Center for National Security Studies; Minneapolis Mayor Donald M. Fraser; Rt. Rev. Paul Moore, Episcopal Bishop of New York; New York lawyer Robert S. Potter; and Roger Wilkins, journalist and senior fellow of the Joint Center for Political Studies which specializes in "black issues." The IPS group identified only two of the Communist Party of the Soviet Union Central Committee officials they met - Georgi A. Arbatov, head of the Institute of the USA and Canada, a "think-tank" that provides research and analysis and also cultivates and develops contacts with Americans at the direction of the KGB and the International Department of the CPSU Central Committee; and Vadim V. Zagladin, first deputy chief of the International Department. In various U.S. interviews, Borosage has floated such standard Soviet themes as the Soviet Union is satisfied by "rough parity" with the United States; that the United States is restarting the arms race; that the Soviets want to go back to SALT II and get U.S. ratification; that if the United States starts another round in the arms race, it will seriously hurt the Soviet economy and ordinary Soviet citizens-but they'll still go ahead, so competition is futile; and the threat that the modern U.S. weapons proposed for deployment are "very dangerous... and would lead to much more dangerous stages that would make both sides insecure, not more secure." Borosage took pains to say that the Soviets are "skeptical" of the disarmament movement and "they hadn't expected it. It was much more powerful and widespread than they'd ever imagined." In 1987, Joanne Landy, Thomas Harrison and Gail Daneker, Directors, Campaign for Peace and Democracy/East and West, New York, circulated a statement Against Loans to Chile calling upon the Reagan Administration to oppose all loans to Chile. It has been signed by leading "peace, labor, human rights, religious and cultural figures from the United States, Western Europe and Latin America." They were "joined by a large number of activists and writers from the USSR and Eastern Europe, many of whom have been persecuted in their own countries for work in independent peace and human rights movements." Roger Wilkins endorsed the call. The majority of signatories were affiliated with Democratic Socialists of America. In 1987 Wilkins became a professor of history and American culture at George Mason University in Fairfax, Virginia. In January 1987 Roger Wilkins attended a National Board meeting of Democratic Socialists of America in Washington DC. In 1988 Wilkins was a senior adviser to the Jesse Jackson Presidential campaign. In 1984 Institute for Policy Studies director Robert Borosage was brought into Jesse Jackson's campaign by IPS fellow Roger Wilkins. Wilkins, a former assistant attorney general and a nephew of the late NAACP president Roy Wilkins, "has helped organize the waves of recent demonstrations outside the South African Embassy." To Jackson, he was a senior adviser. The relationship between "Jesse and IPS is built on me", says Wilkins. Jesse and I have known each other for a very long time, more than 20 years, since he was working for Martin Luther King Jr. and I was in the Department of Justice. As an older fellow I have not always approved of everything Jesse has done; nor have I always approved of his style. Having said that, my sense is that his run in 1984 was historic and constructive. Looking in horror is how Wilkins describes the Reagan years. The defensiveness that the other IPS fellows experience is magnified from a black perspective. Things have happened in these last five years that I wouldn't have believed could happen. Initially, that takes away a lot of your creativity. It's not time to experiment. He has begun work on a book assessing the Great Society. I look at the Great Society as a great experiment, a beginning. As with all experiments, some things had to fail. You learn and go on from there. I would be shocked and dismayed if my conclusion is what we need is more of the Great Society. But I'm not ready to talk about the conclusion. In 1996 Roger Wilkins, George Mason University was one of the original 130 founders of Campaign for America's Future. In 2009, the Editorial board of The Nation included Roger Wilkins, Deborah Meier, Richard Falk, Deepak Bhargava, Norman Birnbaum, Barbara Ehrenreich, Frances FitzGerald, Eric Foner, Philip Green, Lani Guinier, Tom Hayden, Tony Kushner, Elinor Langer, Toni Morrison, Walter Mosley, Victor Navasky, Pedro Antonio Noguera, Richard Parker, Michael Pertschuk, Elizabeth Pochoda, Marcus Raskin, Kristina Rizga, Andrea Batista Schlesinger, and David Weir. This page was last modified on 11 November 2013, at 21:32.